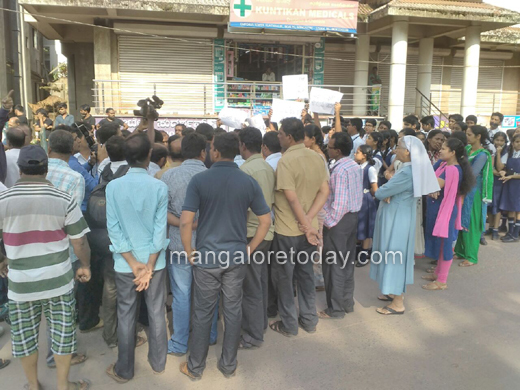 Mangaluru, Dec 07, 2017: Mayor Kavitha Sanil who was scheduled to inaugurate a bar and restaurant at Kuntikan Junction in the city on December 7, Thursday returned without participating in the function following protests by the students of a nearby school who demanded that the bar should not be permitted in a place which is very close by the school. But the irony is that the bar and restaurant was inaugurated as scheduled in the presence of Corporator Shashidhar Hegde and others even after the Mayor who was supposed to inaugurate left the place by heeding to the protestors. It has been learnt that the Mayor had agreed to inaugurate the restaurant as its owner was known to her. 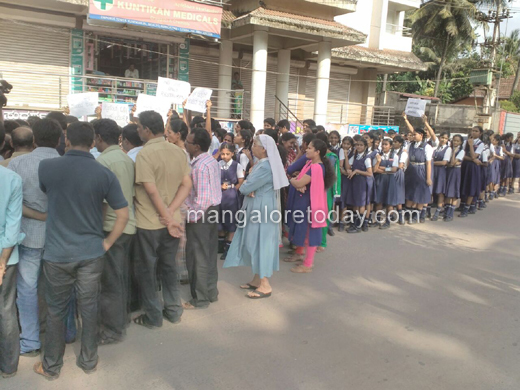 But students of the nearby school protested stating it was within a radius of 100 meters from the school. The Mayor on seeing the protestors went straight to them and heard their grievance and decided to return without participating in the function. "The bar owner is saying he has followed all rules, while the school authorities are arguing that it is within 100 meters distance from the school. The department concerned should solve the problem," she told reporters before leaving the place. A member of the school Parent Teachers’ Association said though a complaint was lodged with the DC as well as the Excise Commissioner so far it has proved futile. She also said they had measured the distance and found that the bar was within 80 meter distance from the school building.